Bausum & Duckett electricians work in Baltimore, Maryland. As a full-service electrical contractor serving the Baltimore area since 1960, we are your area electrical experts. If you need emergency electrical service, our team of over 100 is nearby. When you find an unusual challenge and you’re not sure who to call, call us for services ranging from pool and spa wiring, to landscape lighting, to fire alarms, to telephone and computer network wiring. Whether your job involves simply replacing an outlet or the design and installation of a complete electrical system for your Baltimore home or business, we work to ensure customer satisfaction. We are licensed, bonded and insured in the State of Maryland for your peace of mind. Bausum and Duckett offers all kinds of residential and commercial electrical work in Baltimore, including Site/landscape lighting, Generators, Marina & Pier wiring, Pool & spa wiring, Low voltage lighting, Lighting design, TV, telephone, & data wiring, Security lighting, Lighting control systems, repairing existing wiring problems, recessed lighting , electric panel upgrades, Emergency & exit lighting, Office furniture wiring, pole lighting (50′ Bucket Truck), fire alarm systems, code violation corrections, electric panels, & motor control centers. From fixing code violations to passing a home inspection, go with the electricians you can trust. Rely on Bausum and Duckett Electric. Call or send us your questions or concerns, and we will do our best to help. Bausum and Duckett Electric is nearby Baltimore, Maryland (MD) in 21201, 21202, 21205, 21206, 21209, and more. 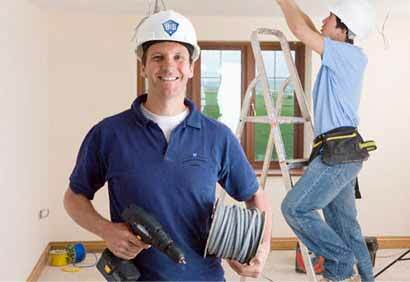 We offer skilled electricians for both residential and commercial customers throughout the Baltimore area.